The popularity of Hogarth’s works remained undiminished in Britain in the hundred years that followed his death in 1764. Prints taken from Hogarth’s own plates remained in near continuous publication during this time and were increasingly supplemented by growing numbers of copies and pirated editions. 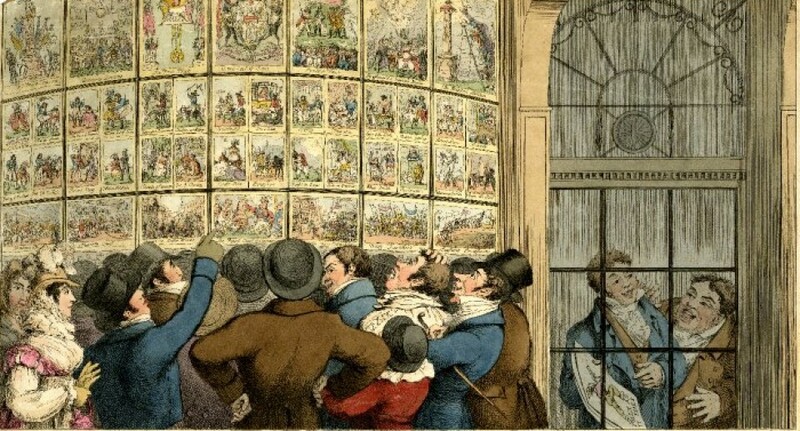 By the closing decades of the Hanoverian era in the 1820s and 1830s, Hogarthian imagery had essentially become a kind of visual vernacular that would have been recognised and understood by almost everyone. A tally of newspaper advertisements from this period give us some indication of just how popular these prints were, with the British Library online newspaper archive containing 680 newspaper advertisements carrying the name ‘Hogarth’ between 1830 and 1835. That’s equivalent to one new advertisement being published every three days for five years. At the lower end of the market demand for Hogarth images was fed by cheap copies and imitations which reworked ideas and images from the original plates. For example, a pair of prints attributed to S.W. Fores and thought to have been published around 1820, presents a politicised version of Industry & Idleness in which the industriousness of the poor is contrasted with the failings of the idle rich. Another example Hogarth’s works being recycled by later generations of caricaturists can be found in this small except from C.J. Grant’s Frontispiece to the Penny Magazine. Volume the Third (c.1833). This was a lithographically engraved ‘scrap sheet’ of small caricature vignettes that could either be viewed as a whole or cut up and reassembled in a scrap book. The humour in the design is derived from a mixture of visual puns and mockery of the antiquated moral and social messages which often underpinned Hogarth’s work. For example, Grant’s Marriage a la Mode is speeding carriage carrying a couple towards an illicit wedding in Gretna Green, making the stilted formalities of the 1740s seem ridiculous by comparison. 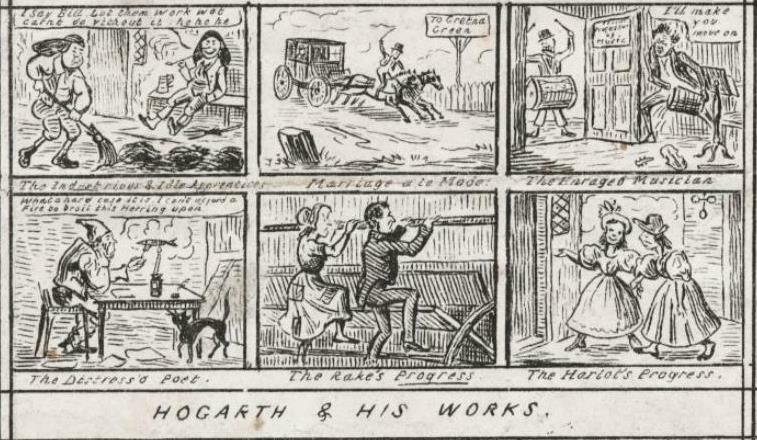 The Rake’s Progress and the Harlot’s Progress arguably convey a more politicised message on the futility of poverty and the complete absence of social mobility in 1830s Britain. In both cases – a couple trapped on a workhouse treadmill and the prostitute being led from a pawn shop to the door of a brothel – the idea that they will be able to progress from their current situation seems nonsensical. It’s possible to place a similar interpretation of Grant’s version of The Industrious & Idle Apprentices, which shows one road-sweeper hard at work whilst his friend lounges on a bench and says “I say Bill, let them work wot carnt do vithout it ha ha ha! [sic]”. The message here seems to be that there is little point in exerting oneself in a society in which one’s chances in life are so heavily determined by birth and social class. The Enraged Musician and The Distress’d Poet are lighter in tone and essentially conventional reworkings of Hogarth’s original designs.